Team Dan4th on the trail! Oh stop it! I’m not Dickens, and Dickens didn’t take winter hut trips with his kids in the Colorado mountains. But if he did, I’m sure he’d say the same about this particular adventure. In the “best of times” column was the 24 hours spent amidst snowy trees and falling snow along the Continental Divide, the very homey Point Breeze Cabin, some kindred company in the form of the Jason and Meggan and their two girls Rachel and Ava, and various other mountain fun. Under “worst of times”, who could overlook the six hour trip between Louisville and Tennessee Pass (normally three hours), the white-out conditions over Fremont Pass (in both directions), and the half hour it took to get between the “Silverthorn Exit One Mile” sign and said exit? Let’s focus on the positive. The hut was very nice. Jason and Meggan were there last month and recommended it as a very kid-friendly place to break in my two progeny to the wonders of backcountry skiing. Point Breeze sleeps eight (ten if you count the two pack-n-plays), has a lighted, covered walkway to the outhouse, and is a whopping 0.7 mile flat ski through lovely forest from the trailhead. We made the heavily-laden trip in with Ella in the borrowed ski-buggy (she fell asleep until I rolled the whole rig over into a tree well). Joe did wonderfully on his strap-on XC skis. Point Breeze Cabin. The left side is the outhouse/woodshed. Team Oliver on the trail. Some trail miles with my wife! Once at the hut, Joe and Rachel spent a while playing in the snow cave and sledding. 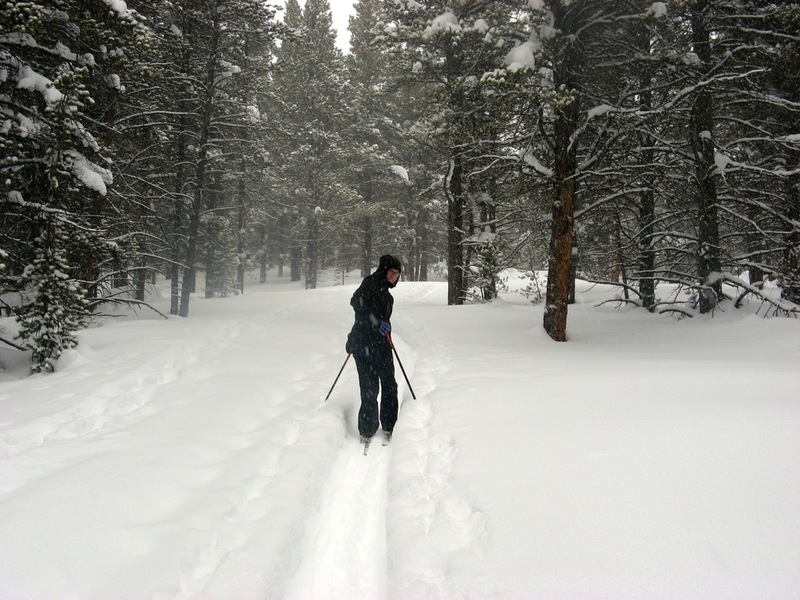 Amy and I had a lovely cross-country tour through the snowy, twilight woods following an old track up to the Divide, through some beautiful glades, then back down to the Colorado Trail to the hut just as it got really dark. Overnight it snowed at least a foot and Jason and Meggan got some freshies on Sunday morning, reportedly finding a few places to properly exercise their superfat AT skis. I don’t know what sins we Coloradans must have committed in our collective past such that we deserve I-70, but they must have been especially vile. On top of the usual ski-weekend gridlock was piled the ongoing blizzard. We’ve heard this tune a few times before, so we stopped off in Breckenridge for a few hours for some dinner to let the traffic die down before heading home. This was a great idea and has worked out well in the past… but more on that later. After dinner, before re-tackling the horror of I-70, came the second high-point of the trip; a rather magical visit to the Breckenridge Ice Castle. Amy had found a Groupon for this a few months ago and it turned out to be really nifty, especially at night in the snow. 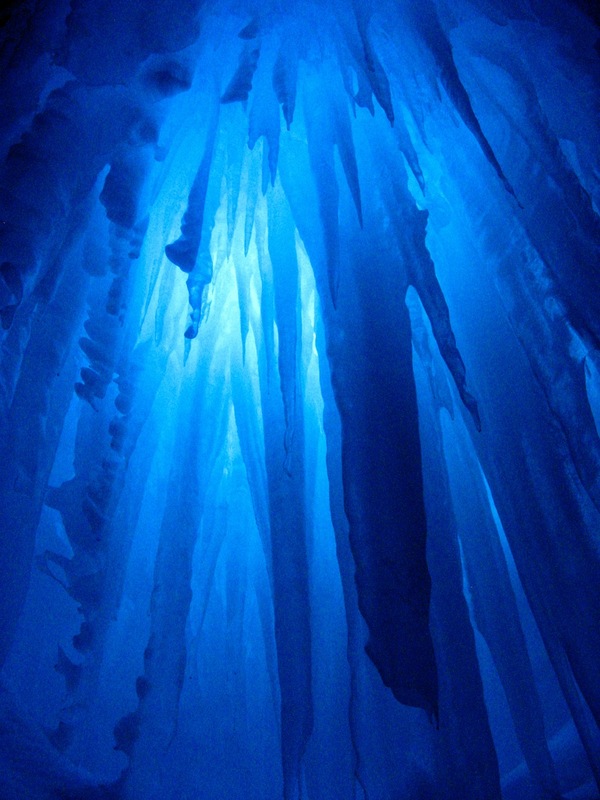 They have constructed a whole forest/canyon/castle/henge out of ice structures, many with buried lighting inside which changes color. Corridors lead to mysterious icy grottos. Ella was enchanted. Joe went wild over nooks and crannies to explore and even found a pair of ice tunnels/slides which enabled surprisingly fast penguin-style belly slides through tight tunnels from one part of the castle to another. I may or may not have been pretty excited about them as well. It was well worth the detour. At the entrance to the Breck Ice Castle before I got my camera set properly. I won’t lie, I’m pretty pleased with this photo. And, for the final entry in the negatives column, the attempted drive home on Sunday night. After a mile in half an hour and seeing the line of stationary red lights stretching up toward the Eisenhower Tunnel, we got lucky and snatched the last hotel room in Summit County where we crashed out amidst other equally-stranded drivers for the night. Driving home Monday morning was still more arduous than normal (avalanche control crews, sloppy roads, snowplows and accidents everywhere), but at least it took only a little longer than normal. Jason and Meggan pushed through, leaving Breck at 8pm and not arriving home until 1:30. So in the final analysis, hut trips with kids (probably without kids as well) are great fun, though far from cheap. The company, settings, and amenities were very nice. However next time, we’ll schedule a more leisurely trip (two nights?) and try for a non-weekend trip as well. 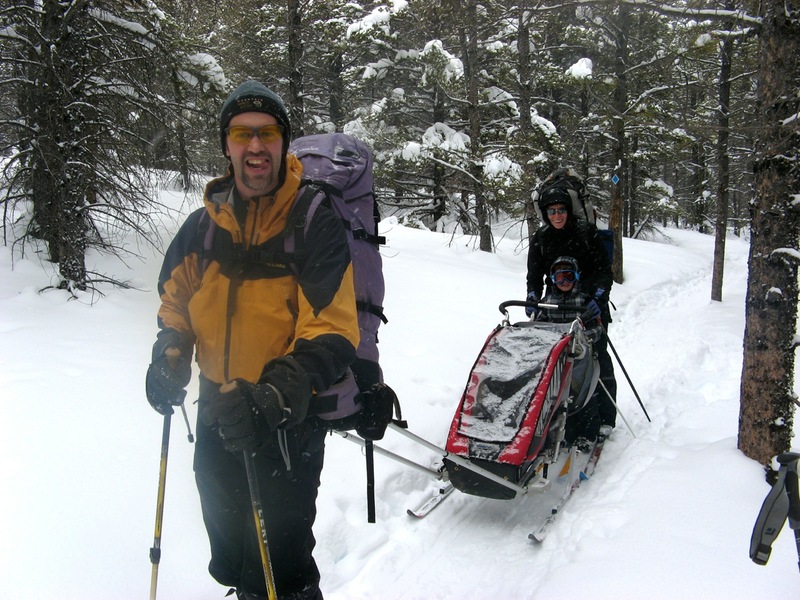 This entry was posted in family, skiing, winter and tagged Continental Divide Cabins, I70 traffic, Leadville, Point Breeze Hut, Tennessee Pass. Bookmark the permalink.